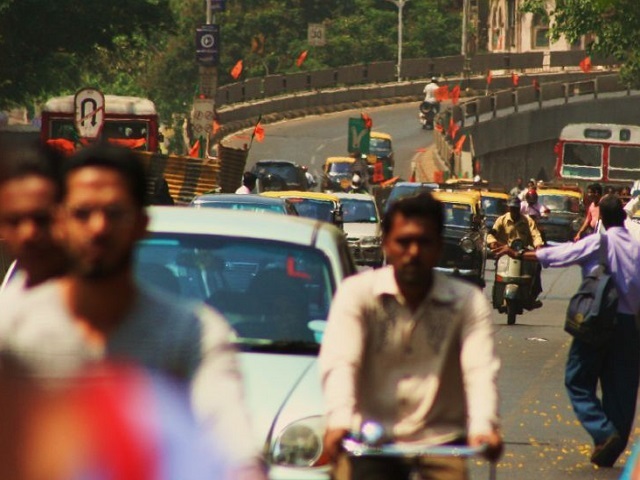 By tapping into the potential of open data, India can make transport more responsive to city dwellers’ mobility needs. Photo by Jonathan E. Shaw/Flickr. India’s new initiative to create smart cities across the country has brought back to light the need for open and accessible data. Although the government legitimized the Right to Information Act in 2005, the data or information requested is usually provided only to the applicant. The establishment of an open government data platform under 2012’s National Data Sharing and Accessibility Policy (NDSAP) is a step towards making some public data open to all, but does little to address data collected at the sub-national level. Transport, for example, is governed at the state level in India. This means that there are no regulations in place encouraging the various agencies collecting data on traffic and public transport services to open data that could completely change urban mobility in India. Despite this, global examples show that these same agencies stand to benefit immensely by opening their data to the public. Open data has the potential to spark innovation, encourage private and public collaboration, and make moving in cities more comfortable, cost effective, and convenient for all. It’s time for Indian cities to begin realizing this potential. While open data is yet to truly take off in Indian cities, it’s already enabling new approaches to mobility in cities across the world. App developers are using open data to help commuters make more informed decisions about their commute. Boston set 15 monthly ridership records in a row from 2011 to 2012 after providing real time data to commuters. Transport for London’s open data feeds encompass the city’s metro, bus, road traffic, bike sharing system, Oyster card journey information, and public restroom data. Opening London’s transport data has resulted in travel time savings valued at $23 – 90 million annually. Furthermore, visualizing data helps reveals macro patterns and information gaps that can inform decision-making for planners, government officials, and citizens alike. The Chicago Department of Transportation and Divvy, the city’s bike sharing system, recently released data from over 3.2 million trips as part of the Divvy Data Challenge, encouraging data scientists, designers, programmers, and civil society to analyze and present the data in visually compelling ways. Additionally, multiple initiatives aimed at using open data to improve mobility in São Paulo are building a broader culture of open information through public participation and crowdsourcing. In cities like Beijing, Chennai, and Porto Alegre, online public participation platforms are changing the way citizens interact with city leaders and expanding the set of tools local governments have to collect data. Many of these platforms are products of collaboration between government and civil society. In order to encourage more cities to open their data, Institute of Urban Transport along with EMBARQ India launched a Data Visualization Challenge last year that offered a slice of raw transport data to citizens, providing them with an opportunity to decipher and visualize the data. The datasets covered mode share, trip length, emission levels, population density, road length, and other indicators for 15 Indian cities. The shortlisted entries were displayed and five winners were announced at the Urban Mobility India Conference 2014 (UMI) in New Delhi in November 2014. The resulting visualizations addressed themes like vehicle density and air quality, road safety, mobility for working women, and the relationship between mode shares and traffic crashes. 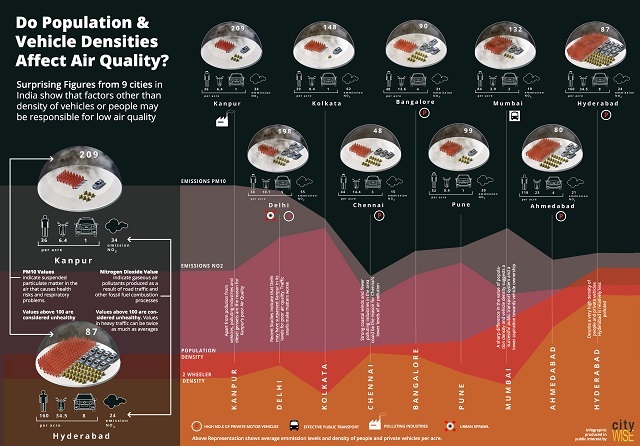 One of five winners of the 2014 Data Visualization Challenge, this data visualization shows the relationship between population density, vehicles, and air quality in Indian cities. Graphic by Sudipto Ghosh/City Wise. As the first of its kind in India, the Challenge revealed significant gaps in government data collection and maintenance. Because data collection techniques differ between cities, comparing data across cities was not always reliable, and some city data was even found to be inaccurate or incomplete. These shortcomings limit what data visualization can reveal and the insight it can hold for planners and city leaders. McKinsey estimates that the potential economic value of open data in transport is between $720 – 920 billion globally, with innovation in commuter decision-making and the growth of new mobility businesses accounting for $300 billion of that. Considering the market size and geography of India, opening government data can radically improve how people move in cities. Crowdsourcing and public participation can help in correcting or reducing the inconsistencies in current data sets. Appropriate standards and formats for managing databases can help transit agencies, and will also be useful for entrepreneurs to bring innovation to the urban mobility sector. Although some transit agencies in India such as DIMTS and BMTC have created passenger information systems to offer real-time information, their platforms are not interactive and their data is still not open. The emergence of companies like OlaCabs and Traffline is paving the road for innovative enterprises. Open data can further this by creating a more supportive environment for mobility startups. It can also make urban mobility a more attractive sector for investor and corporations. These two factors combine to create an ecosystem that catalyzes entrepreneurship in urban mobility, ultimately making it safer and easier to move around our cities.